Welcome Amy Lignor, a fantastic author. I’m very happy to have her on my blog today. She has even agreed to give away an e-book copy of her book, which I will add more about after the interview. I came into contact with Amy when she asked me to read and review her book, Until Next Time which was a fantastic read. You can find the review by clicking here. I have since greatly enjoyed talking with Amy and am really excited to be doing an interview with her. I hope everyone enjoys this interview and will check out Until Next Time if you haven’t already. Christie: Welcome Amy! Thank you for joining me today for an interview. Please tell us a little about yourself. Amy: I was raised on books - literally :). My Mom was a career librarian, so while all the kids were going to the movies or hanging out on the sports field, I was in the library surrounded by my absolute favorite things in the whole world! I’ve been writing since I was thirteen-years-old, and my Freshman Social Studies teacher was actually the first one to tell me that I should be a writer as a career, after I wrote an essay about Rasputin. Christie: It sounds like you had a great childhood. It is very awesome that the teacher encouraged you to become a writer. It would be cool if they saw your book and saw they were right! Amen to no snow! 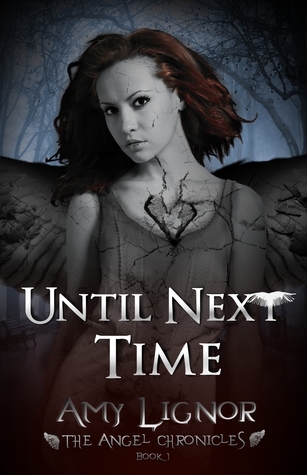 Christie: Your New book Until Next Time, which is also the first book in the Angel Chronicles series is about angels. What made you decide to write about Angels? Amy: Actually it all came about when I was thirteen. I lost my grandfather and I was truly heartbroken. I began to think about where he went and whether or not, if there were such a thing as angels, why they would possibly come down into a place that was so filled with pain, death, heartache, etc. I dreamed about Matt when I was going through this time period; not a ‘romantic’ dream, just a boy who showed me around a large library where we sat and talked a great deal. He wanted to be a part of this world and, I guess you could call this an ‘imaginary friend,’ helped me through one of the toughest times in my life. When my father passed away too early about ten years ago, Matt and the dreams returned, and I suddenly knew that it was time to tell his and Emily’s story. Christie: That is very personal. I’m glad you found a way to deal with the grief that ended up creating a great story. Thank you for sharing the story with us, that must have been hard with it being so personal. Christie: Did you base any of your characters off of real people? Amy: There are a few characters ‘up there’ that I based on my grandfather and my father - two extremely wise men who had the biggest hearts imaginable. Emily is based a great deal on how I felt at that time, and how to face the world while trying to still hold on to that ‘faith’ she has in her partner. Christie: Matt and Emily were supposed to be soul mates but fate took them on a different course when they were sent down to earth. This changes things between them, will they be pushed back together in the future? Amy: The true core of each book is Emily and Matt’s friendship, love, work and the decisions that have to be made between them. Although Emily is the one with a ‘human’ romance in Until Next Time, she is also the one who wants to be ‘home;’ whereas Matt actually likes to be free and living on Earth. There are twists and turns coming up for the angel/warrior team - and Emily and Matt have more than a few surprises when it comes to their friendship and love. So, the upside is, readers will not know the conclusion until the actual conclusion. LOL. Christie: that sounds great! I can’t wait for these twists and turns. Christie: Will Jason show up again in future books? Amy: Yes, Jason will return, as will Charles and Faith - just not in the same ‘form’ as readers think. Christie: that makes me very happy! Christie: What made you start writing? Was there a specific author that inspired you to write yourself. Amy: I have so many favorite authors it’s almost impossible to name them all. Each genre has its own ‘masters.’ Writing was a very personal thing at the beginning of my life, but I have fallen in love with many authors who’ve helped me along the way. From the classics of Austen and Poe to the modern stories, such as Rowling and Koontz, literature is one of the most amazing things - to me - that this world has to offer. Christie: Do you have a favorite Angel? Amy: In the book, Matt is my favorite. He is the warrior and thinks with his heart and his deep passion for life, freedom and the job he has to do. Emily has it a lot harder. As an angel, she doesn’t have one ‘job’ to do; she has to find a way to balance everything and it’s far more stressful on her. In the ‘personal’ world, I love Gabriel. He was written in a specific way that blends fun and humor with the fact that he could teach a warrior how to be the ‘best of the best.’ He’s like an older brother. Christie: Is there anything you can tell us about the next book? Some awesome detail to hold me over until it comes out more specifically. Amy: Let’s say that the next book has more of a focus on Matt this time around, and they will be living in a very ‘gilded’ time period that was based on wealth, greed, and a nation that was just about to grow into THE one that everyone wanted to come to in order to find their chance at a ‘golden’ life. Christie: I look forward to finding out more about Matt! Christie: What is your writing style? Do you have any advice for other writers? Amy: My writing style is a combination of research (I love history and I want to make sure that locales, time periods, buildings, etc., are all correct); plus the ability to just let go with the imagination. I really can’t do an ‘outline’ before writing and then simply follow along. Twists and turns come up, characters change - so I never hold myself to one thing. Not to mention I get so ‘deeply embedded’ in the story that I feel like I’m the narrator telling ‘their’ story, and I’m just along for the ride. Advice…do NOT give up. I started my company, The Write Companion, a while back because I was tired of seeing writers give up because of a rejection letter. There will be many…and you have to be able to solidify your backbone, KNOW that you are right, and keep right on going. A rejection letter just brings you closer to the eventual acceptance. Christie: I can’t do outlines either I totally agree with you. You just can’t always know where the story and characters will take you. That is great advice and very admirable. The writing world is a tough one. Christie: is there anything I didn’t think of to ask that you would like to tell us? Amy: LOL. I actually just want to thank the readers and the bloggers, as well as everyone who got so into the book thus far that they’ve made Team Jason and Team Matt buttons. J I am beyond proud of these characters, and it’s nice to see the ‘winged ones’ edging out the ‘fanged ones’ every once in a while. I hope everyone gets on board with Emily & Matt and follows them even further to see exactly how they turn out! Christie: Thank you again Amy for joining me for this interview. I hope to have you on my blog again in the future. I had a fantastic time talking with you. Amy: Anytime! Thank you for having me! About Amy: Amy Lignor began her career at Grey House Publishing in northwest Connecticut where she was the Editor-in-Chief of numerous educational and business directories. One person can win a copy of Until Next Time by Amy Lignor. Open Internationally and you must be a follower of my blog to win. To enter, fill out the rafflecopter form below. The winner will be notified by email and will have 48 hours to respond or another winner will be chosen. You can also buy a copy of Until Next Time and support the author now from Barnes and Noble and Amazon. It is SO amazing to have met you out here in cyberspace and I am so honored to be a part of your site! Thank you Christie for the phenomenal review and post and I hope to work with you in the future! I agree! I'm very glad we met and I got to read and review your awesome book. You are very welcome I loved doing the review! I definitely look forward to working with you more in the future especially when your next book comes out! I reviewed this novel for the Tribute blog tour..so i did not enter..but i loved the novel and wanted to learn more about her and this terrific tale. Loved the interview..and thanks Amy for sharing your story with us. Awesome glad you could review it and be a part of the blog tour. I'm glad you loved it and so glad you stopped by thank you! You are welcome! I'm so happy to help and support a great book and author!! Have never heard of this book but I will check it out now! Thanks for the interview. I like when I stumble upon something new to read. Thanks for the chance to win one! Happy Reading. Yippee! I WON! I Can't wait to rad this....something new and it looks fabulous! Thanks again for the great giveaway. I'm glad Amy was able to be inspired by tragedy and to make something positive out of it.